Navigating the world of essential oils takes a little bit of expertise, but we’re here to help. We’ve put together this lavender essential oil buying guide so that you make the right choices to get the most benefit from your essential oils. You can use them in all sorts of applications, including soothing sore muscles and relaxing aromatherapy. Before we go much farther, here are some things you should know. Organic: Organic oils won’t contain any chemical that is processed or comes from anything but a plant-derived source. This is a great thing for essential oils if you want them natural and able to do all of the things you need. Package Size: How much do you get? Traditionally essential oils don’t come in huge packages, so a smaller package here isn’t necessarily a bad thing. You won’t use a ton at once, so go for cost-efficiency in your essential oils. 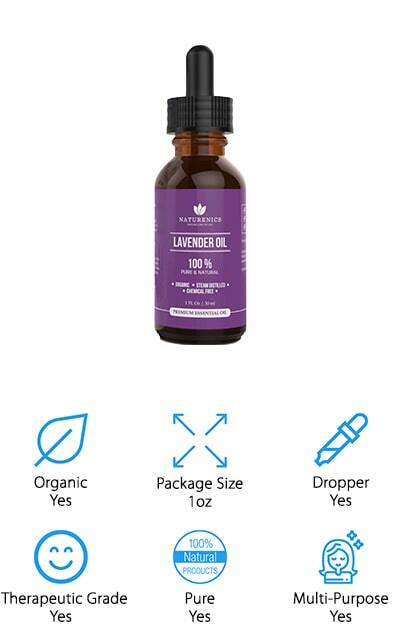 Dropper: A dropper is one of the best ways to get your essential oil out of the bottle. Certain brands might include reduction tops that use the same effect, but droppers will be more precise for measurement. Therapeutic Grade: The use of the term ‘therapeutic grade’ refers to the quality of the essential oil. When an oil can claim to be a therapeutic grade, it’s claiming a higher quality level than oils that don’t boast any grade. Pure: A pure essential oil is made of oil the plant oil and nothing more. This means a pure lavender oil will only contain lavender as the ingredient. Nothing else can be added to the oil for it to be pure. Multi-Purpose: Can the oil be used for multiple things? The oils on this list are mostly multi-purpose, meaning that they can be used in a diffuser or added to a carrier oil for a topical skin treatment. It’s your choice. Keeping that information in mind, let’s take a stroll through some of our lavender essential oil reviews. We’ve done a ton of research and compiled only the best essential oils for you. We’re sure you’re going to find your new favorite essential oil brand on our list. Our top pick and budget pick are highlights but don’t stop there. The rest of these oils are aromatic and effective as well, so take a look. doTERRA is one of the leading brands that make pure, organic essential oils today. Their lavender oil is absolutely no exception. It only contains lavender extract, which means that it’s the best you’ll get as far as purity. It’s one of the best-smelling lavender essential oils on our list, and you can use it in a variety of ways. Because of the quality of this oil, you can use it in your baking or marinades as well. It’s a food-grade oil that you can also toss in the bath or use as a perfume. Use it with a carrier oil for a massage tincture, or take it internally in order to help keep anxiety at bay. It’s all natural, holistic, and helps to promote a peaceful night of sleep. You get half an ounce of oil here, and it’s sure to be of the absolute highest quality and usable for every single purpose you can think of. Our budget pick is this affordable oil by Healing Solutions. You know that it’s going to be more affordable, first and foremost, because of the package size. This bottle contains a third of an ounce of pure oil, so you’re paying a little more for the quality. It smells great and doesn’t feel greasier than it should. It’s a good blending oil when you’re making combination aromatherapy projects, and it goes great in a carrier as well. This lavender essential oil for skin will help to reduce irritation when used with other healing methods, and it will make you smell really good in the process. It’s organic, so it uses only the best French lavender, and that’s all it contains. There are no additives or chemicals in this oil, and that is one of the reasons that it made our list. This oil is pure and direct from the source. You’re going to love it. Naturenics makes a pure, organic essential oil that you can use for anything that you’ll ever need it for. You’ll get a full 1 ounce of oil for the price, which is pretty efficient in the long run. It doesn’t contain anything else: no chemicals, sulfates, gluten, or parabens. It’s an ultra-concentrated oil that will start working to make you feel better right away. It’s more potent and smells better. You won’t need as much to get the same effect as with some other oils. This is actually a kit that comes with the oil, a dropper to use in the bottle, and a roll-on bottle to use it on your skin. Plus, it comes with an e-Book that explains everything you could ever want to know about essential oils. Because you can use it anyway, you can easily try this lavender essential oil for sleep or for reducing and dealing with stress. It’s a great product! 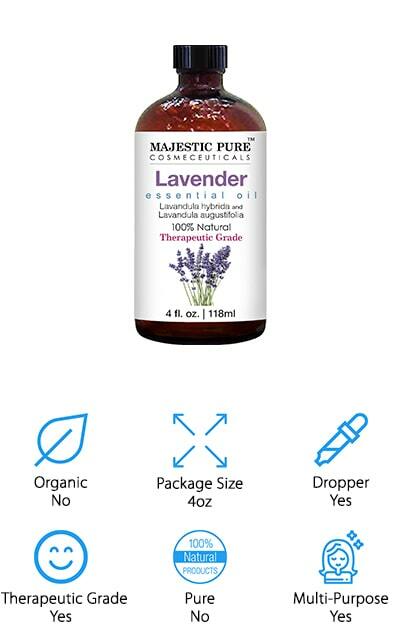 Majestic is one of the most popular brands that produce essential oils today, mainly because of their great prices. 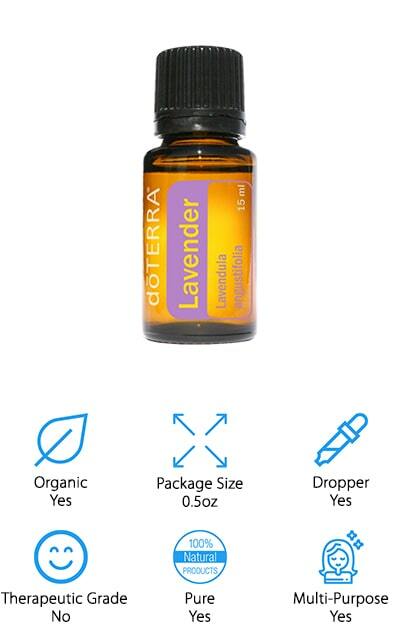 You get 4 ounces of lavender oil in this order, which is the largest amount yet, and for a great price! It’s a therapeutic grade oil that you can use however you’d like. It has a rich scent and sources its lavender to France and Bulgaria. That’s pretty amazing! It’s also distilled by steam so it retains much of its original potency. Always use in a carrier oil before applying to your skin, as this lavender essential oil for face and skin problems is extremely potent. This scent can blend well with any other oil and become any compound that you need, including a massage oil or aromatherapy treatment. It even comes with a glass dropper for easy dispensing into whatever mixture or uses you need it for. This versatile oil is an investment and it will last you forever. This lavender oil is extremely potent. Artizen delivers an oil that you can use for anything, but you should probably blend it before putting it directly on your skin. Because of the purity and concentration of the lavender in this oil, it might irritate your skin rather than soothing it. This is one of the highest grades of oil on our list, and the price shows that. When it comes to essential oils, you don’t want to go with the most inexpensive option as it might not be all that it boasts to be. This one comes with a dropper and 1 ounce of oil. They back up their products with a lifetime guarantee and warranty that you’ll rarely find in any other oil. They stand behind their product proudly. That’s how you know that it’s going to be everything that you need it to be. We love this oil, and we know you will too. 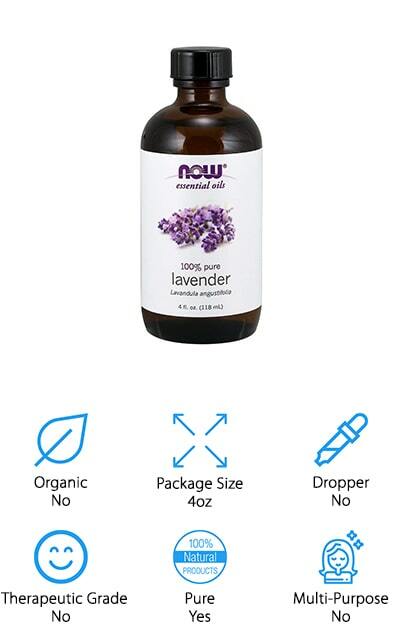 NOW Solutions lavender oil is one of the only oils on our list that is suggested for use with a single purpose. This is a diffuser oil, so it’s only meant to be used for aromatherapy and should not be applied to the skin. However, the formula is 100% pure lavender and if you use it in an essential oil blend, you will find that it might just soothe your nerves and make you feel more relaxed. 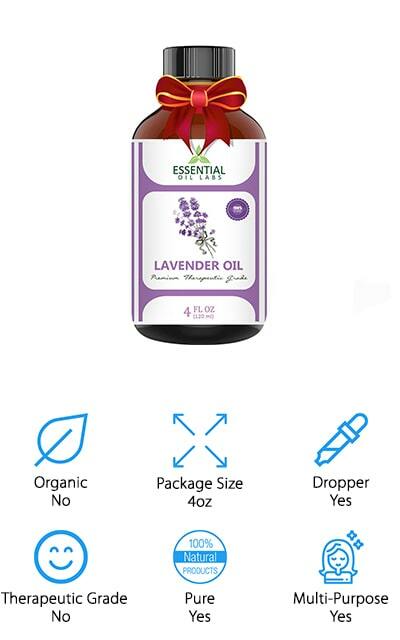 NOW Solutions has distilled this lavender oil through steam, which is one of the best extraction methods available to make sure that you’re getting the most benefit from your essential oils. If aromatherapy is your thing, I wouldn’t pass this oil up. It will work great for you, and you get a full 4 ounces so it will go for quite a while before you have to purchase again. It blends exceptionally well with peppermint and chamomile oils. 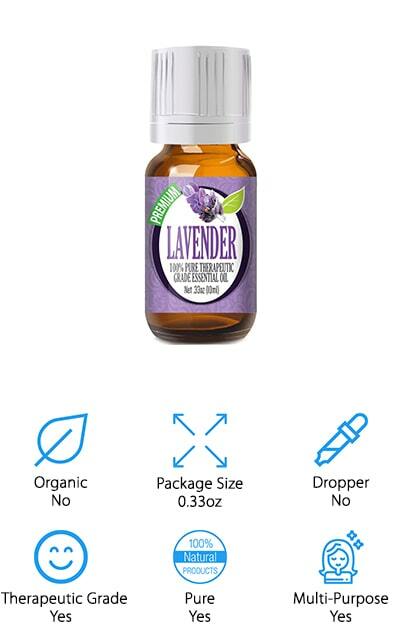 Essential Oil Labs makes this lavender oil that is high-quality and that you need to have in your collection. You can use it for just about anything. It’s a great lavender essential oil for hair, and you can use it on your skin once you’ve diluted it in a carrier. It doesn’t contain any harsh chemicals so it won’t damage your skin or hair like others might. You can even use it in deodorants, candles, lip balms, and shampoos. It’s a DIY-ers best friend, honestly. If you’re into making soaps and scrubs, you can use this oil for a great scent in your mixture. You can also use it to make your own non toxic bug sprays. It’s entirely up to you! Essential Oil labs source its lavender to Bulgaria, which means that it’s ethically and sustainably sourced. 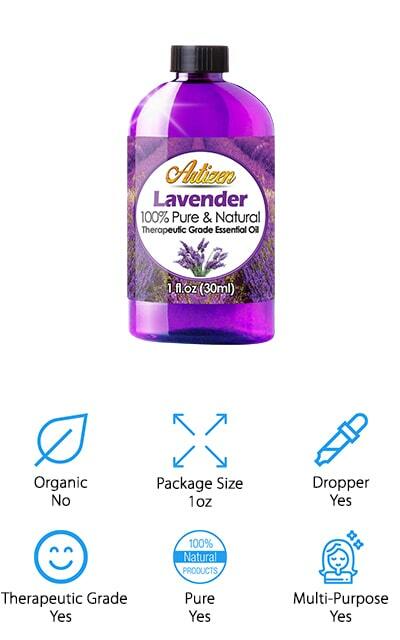 You’re getting the best undiluted lavender oil on the market, and they stand behind that with a satisfaction guarantee. Pure Body makes this pure blend that is actually one of the best lavender essential oils for dogs. If your dog has dry skin or an itchy patch, you can apply diluted lavender oil to help soothe their itching. Plus, they’re going to smell amazing when you’re done. 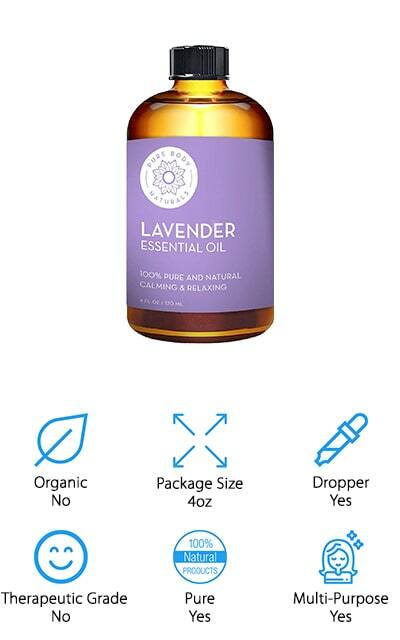 You get 4 ounces of oil in this purchase, and it’s been steam-distilled for the purest lavender content. It can give you some great aromatherapy benefits, including soothing headaches and reducing stress. If you want to relax, this should be your go-to essential oil scent for your diffuser. It’s perfectly versatile and you can use it for just about anything you could use any other oil for. It’s pure and chemical-free and doesn’t use any synthetic ingredients. In fact, this would even make a great lavender essential oil for babies if you’re looking to soothe a rash. The possibilities are endless with a pure essential oil like Pure Body Naturals provides. 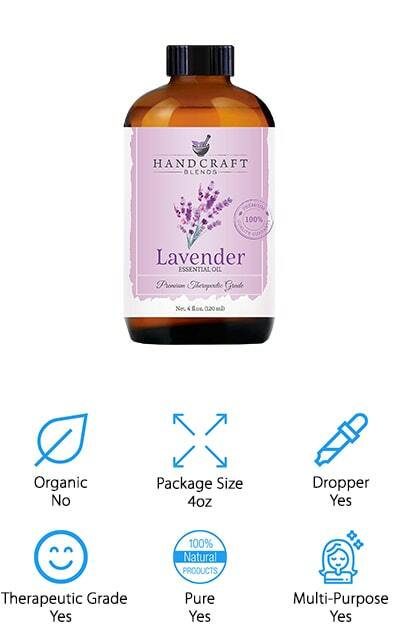 This lavender essential oil by Handcraft is 100% pure. It’s not made of isolates or mixtures of scents to mimic lavender – it’s the real deal. You get 4 ounces of therapeutic grade lavender oil that you can use for aromatherapy, soothing dry skin, and using with the intention of getting rid of your nerves. It comes in a high-quality glass bottle that looks and feels great, with a glass dropper for easy mixing and distribution. It doesn’t take much to blend well with lavender, and some of the scents it blends best with include sandalwood, lemon, clove, and bergamot. You can make your own massage oils by adding different scents to a carrier oil, and you’re to love both the scent and the results. You’ll feel much more relaxed afterward. There are no fillers or additives in this mixture – you’re getting exactly what you expect to get, and that’s a great thing. You should give it a try. 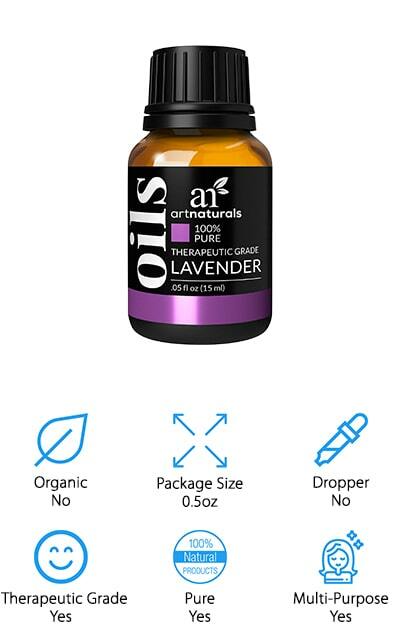 Last on our list is this essential oil by ArtNaturals. They have an entire line of undiluted, therapeutic-grade essential oils that are pure and cruelty-free. You can use this oil with a carrier oil to help relax at the end of the day and get a great night of sleep. It’s one of the best scents for massage oil because of its relaxing properties. If you’re looking for essential oil recipes or any other DIY materials, ArtNaturals has you covered. They provide information on their website to help you get the most out of their essential oils, so check it out if you’re new to using them. Plus, they back up all of their oils with a satisfaction guarantee that you’ll love it or they’ll give you your money back. What have you got to lose? Choose from their selection of diffusers and scents to create a relaxing environment. You’ll love the relaxation that comes with this oil.